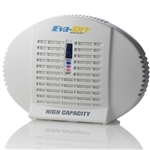 Eva-Dry E333 Renewable Mini-Dehumidifier protects up to 333 Cubic Ft., and lasts up to 10 years. Moisture Absorber Ideal for Small Spaces. Eva-Dry E500 High Capacity Dehumidifier protects up to 500 Cubic Ft., and lasts up to 10 years. Great for preventing mold and mildew. GoldenRod Dehumidifiers are great to be use inside of gun safes to protect your valuables from rust, corrosion and mildew.